You'll be £13.50 closer to your next £10.00 credit when you purchase RMS Titanic. What's this? RMS Titanic has had more written about her than any other ship but, surprisingly, there is little information directed at the model shipwright. This new edition of the bestselling manual contains all the information needed to build a highly accurate model, right down to the tiniest details of the hull's rivets. The book is based on the author's own remarkable 18ft model, commissioned for a travelling exhibition through North America and Europe. It contains a mass of practical information on how to construct every part of the great liner and is equally useful for building a small, static bread-and-butter display model as it is for creating a large-scale working version. It is illustrated throughout with superb close-up photographs of the model, detailed drawings, and a large collection of photographs of the prototype herself. In addition the book contains a complete set of plans of the Titanic which are considered to be the most accurate yet drawn. This new paperback edition makes all this remarkable information available again to a new generation of Titanic enthusiasts and modellers. With its mix of practical advice, rare photographs,and highly detailed drawings, this step-by-step guide is an indispensable addition to the bookshelves of all Titanic modelmaker’s and enthusiasts. A very useful book for builders of naval models scratch book. RMS Titanic is the ultimate ship modeller’s guide to the world’s most famous liner, and contains all the information needed to build a highly accurate model, right down to the finest details of the hull’s rivets. The 400 photographs and details drawings, deemed the most accurate available, depict the author’s 18ft model, built to 1/48 scale, which is regarded as one of the finest yet produced. The book’s text contains a mass of practical information on how to construct every part of the great liner. With a mix of practical advice, rare photographs and highly detailed drawings, the book could be a welcome addition to the shelves of all Titanic enthusiasts and modelmakers, but make no mistake, good modelmaking is not easy. Titanic, no other ship's name can conjure up so many images in one's mid. The ship was the epitome of luxury, affluence and status. The tragedy of the loss of over 1500 souls; the love of Ida and Isador Straus, who would not be separated and chose to go down with the ship together rather than one should live apart from the other; or of the ships remains broken and batterd on the ocean floor. RMS Titanic has had more written about her than any other ship, but surprisingly there is little information directed at the modelmaker. This superb book contains all the information needed to build a highly accurate model, down to the tiniest details of the hull's rivets. The work is based on the author's remarkable 18 foot model, built to 1/48 scale, and specially commissioned for a traveling exhibition in North America. Filled with 19 colour plates and numerous b/w photos the book is quite thorough in it's detail of the making of this scale model of the Titanic. The author is a well known ship builder and here he has taken his expertise to show the process of building this liner in 1/48 scale. Anyone looking for detailed or technical information of the exterior of the Titanic will want to have this book on their reference shelf. I would not hesitate recommending this to anyone building the liner of Titanic or Titanic enthusiasts out there. Almost 100 years after her fatal encounter with the iceberg, the Titanic continues to exert a magnetic fascination that has never subsided, fuelled in recent years by the discovery of the wreck and by the eponymous blockbuster film. This book, originally published in 2005, seeks to provide a definitive modelmaker's guide to the vessel by drawing on a range of historical sources and upon information from the wreck itself. The construction of the model is described in minute detail, beginning with the hull and progressively working upwards to the funnels and lifeboats. 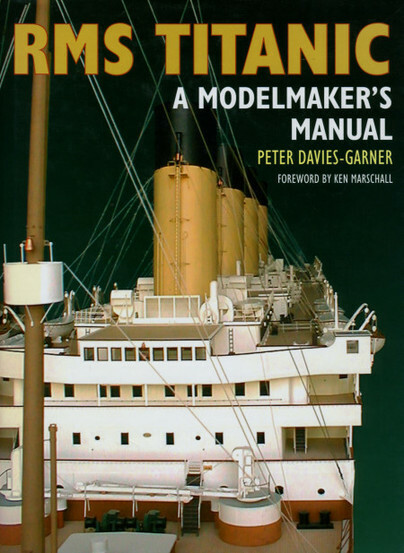 Although the book details the construction of one particular model, it is also a mine of information on the ship itself which will be essential reading to any aspiring Titanic modelmaker. A must for all Titanic modelling enthusiasts. Surely the ultimate goal of any ship modeller is to construct an accurate replica of the world’s most famous luxury liner – the RMS Titanic. Up until now, this was thought by many an impossible task as surprisingly little detail of the ship had been documented. However, in 2001, full time modelmaker Peter Davies-Garner was commissioned to build as accurate as possible a Titanic model for an exhibition in Florida. This task led him on a quest to gain as much information as he could about the liner, utilizing a diverse range of sources and supplementing incomplete plans with contemporary photographs and wreck footage, among other things. Although some details are still debatable, this book is undoubtedly the closest to an accurate description of the Titanic that is, or is ever likely to be, in existence. A must-have for all Titanic enthusiasts and modelmakers alike, this book provides a wealth of information and guidance on building a model of the ship, right down to the tiniest of the hull’s rivets. It also contains many highly detailed drawings and photographs of the magnificent 18ft model produced by the author as well as a fascinating complement of rare and evocative photographs of the real Titanic itself, appealing to anyone with an interest in one of history’s most famous seacraft. Peter Davies-Garner is a full-time modelmaker who trained as an architect, and much of his modelling has been for architectural practices.